This is a 21st Century love story where once upon a time Charlene met Patrick over the internet and true love blossomed between the pair. 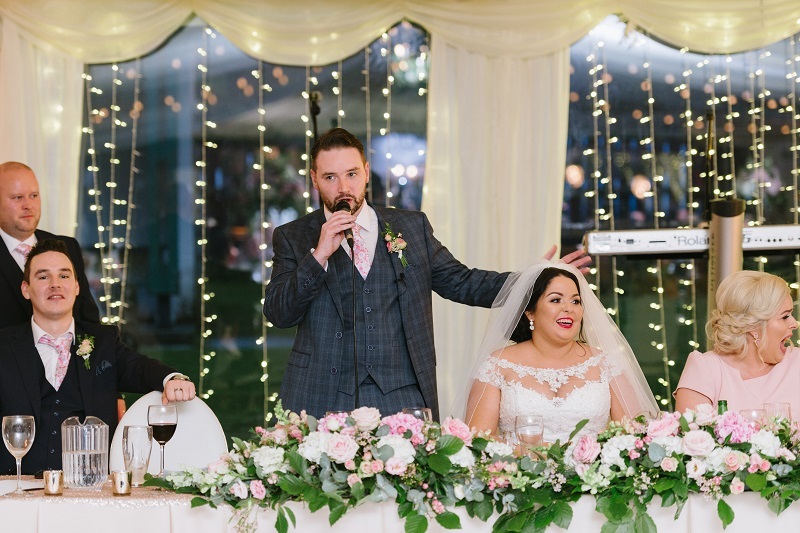 Paddy tells the story so much better than I ever could and when he stood up to give his speech and spoke about the journey to their Wedding Day it was so heartfelt and emotional, everyone (even Patsy! – more about her later…) had a little dampness around the eyes. As with a lot of modern romances Paddy and Charlene lived apart for a while due to work. 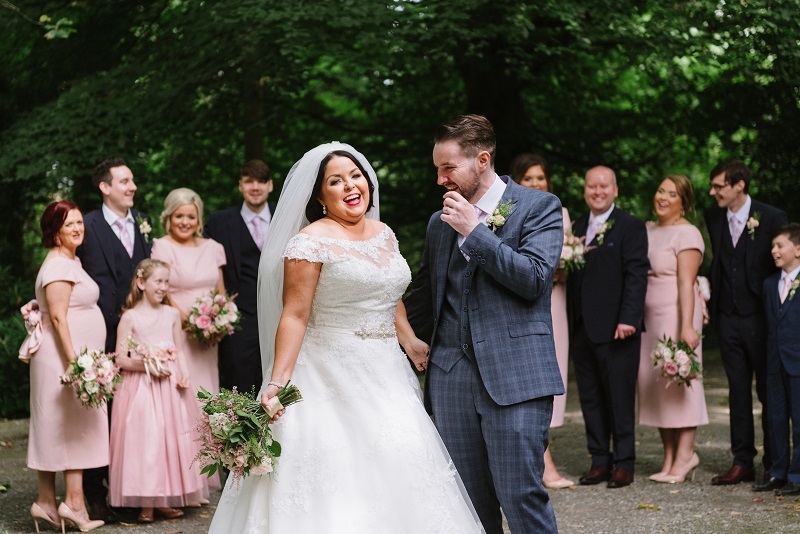 When he recounted the day that he drove Charlene to Dublin airport to wave her off to live in Dubai, it almost broke my heart and you could sense just how much this man loved this woman. Charlene and Paddy where destined to be together and no amount of distance was going to come between them! Eventually Paddy moved to Dubai to join Charlene and they have enjoyed the most wonderful adventure together, living the dream. For Charlene’s 30th Birthday Patrick surprised her with a trip to Reykjavik where he also popped the question in the romantic setting of the Blue Lagoon – if anyone needs tips in the romance department then Paddy is your man! 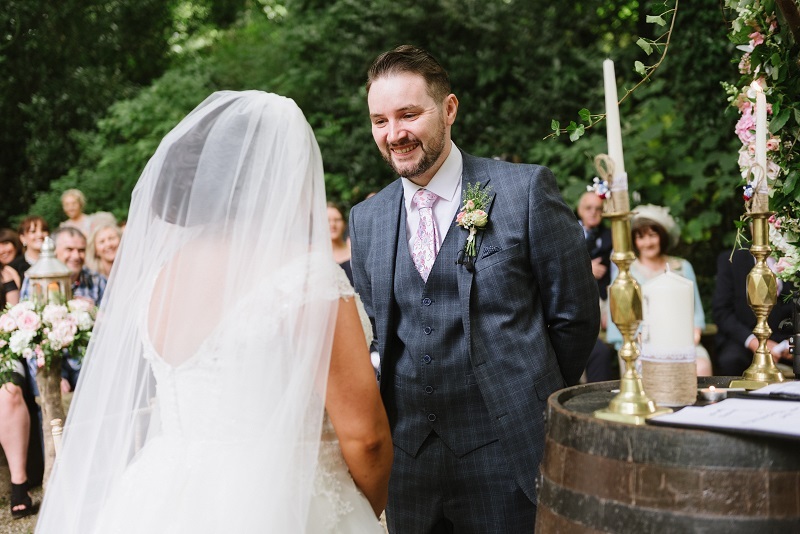 One of the biggest concerns for everyone was the outside woodland ceremony that was due to take place in the stunning grounds of The Beech Hill Hotel. This was early September in Ireland, so it was anyone’s guess as to what the weather would be like! On the morning of the big day we woke up to a truly beautiful day, the only day that week where the sun had come out and it was all for this lucky couple. I arrived at the Beech Hill at 8am and the Bridal Party where being transformed by Toni Kelly and her team. Both families had stayed at the hotel the night before, so everyone was relaxed and enjoying getting ready without having to rush around. Having everything in the one venue made everything so much easier and took away a lot of the stress when co-ordinating everything. While the ladies got pampered and the boys enjoyed a sneaky lie in, myself and my little helper headed to the marquee to set everything up for the guests. I love this venue. It was my first time working at The Beech Hill and I was amazed at just how beautiful it is. Patsy is the owner and she is an absolute legend. Nothing gets past ‘no nonsense Patsy’ and she runs everything with an iron fist, but she gets stuff done and her doggedness about timings means that everything runs to time, and the food is impeccable. As well as Patsy I worked alongside Kieran and he is fabulous. If you are lucky enough to have him taking care of your wedding, then you are in very safe hands. Every member of staff at the hotel are wonderful and the front of house team are so welcoming and helpful. Highly recommend this venue to anyone. 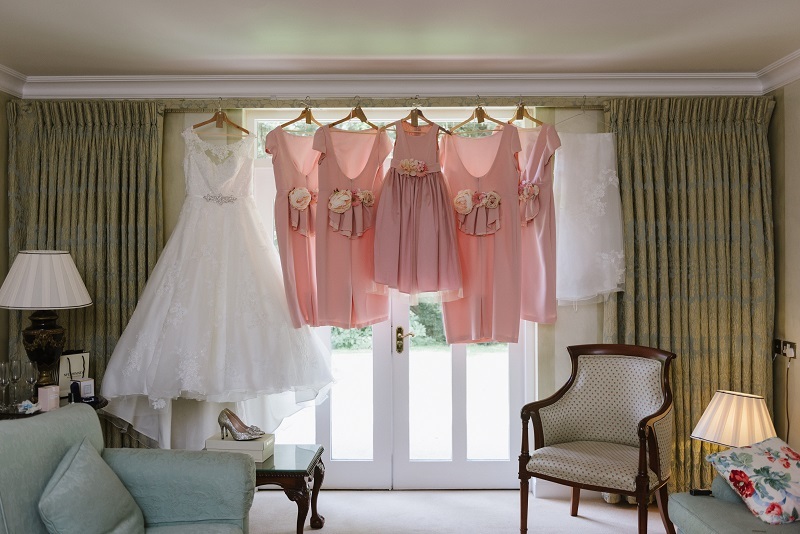 Once we had set up the Marquee and the Woodland Ceremony I went back over to the hotel to get Charlene and the girls dressed and ready for the ceremony. (Lily Annabella and House of Elliott transformed both areas and the results where incredible so there’s a separate décor blog to follow!) 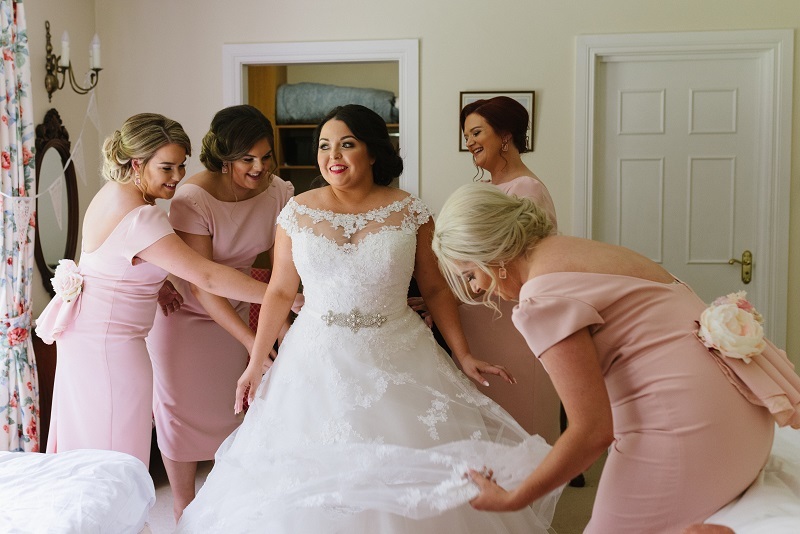 Charlene choose a stunning lace ballgown dress from the Ronald Joyce collection at McElhinneys Bridal Rooms and had is customised to how she wanted it and of course had the all-important pockets added to it! She looked so glamorous and her bridesmaids looked fab in their custom-made dresses from the very talented Ellen Lambert Creations. This is always one of my favourite parts of the day, tensions are high, and nerves are kicking in but I love being there to help everyone get into their dresses and keep everyone calm with my awful jokes and stories! 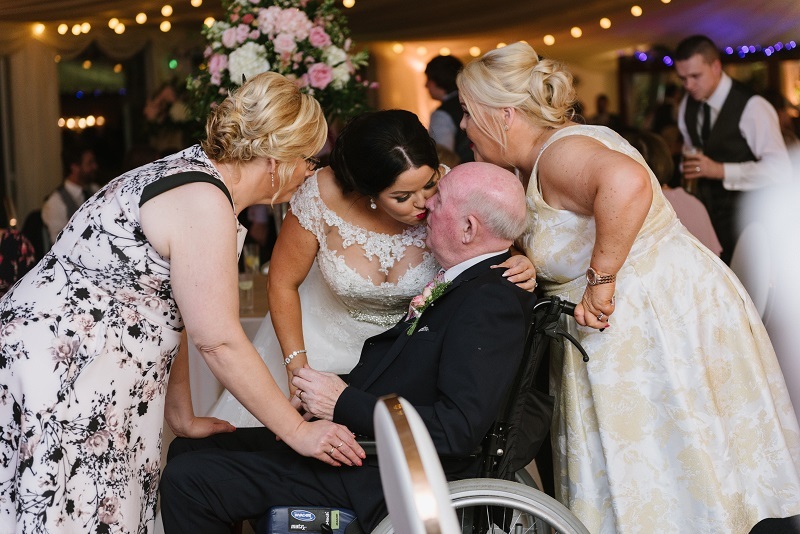 Charlene’s Dad has been unwell for some time and is confined to a wheelchair, so her brother Paul was doing the honour of walking her down the aisle. Charlene’s lovely Mum brought her Dad into the room to see Charlene in her dress ahead of the ceremony and it was a beautiful moment between them and one I know she will always cherish. 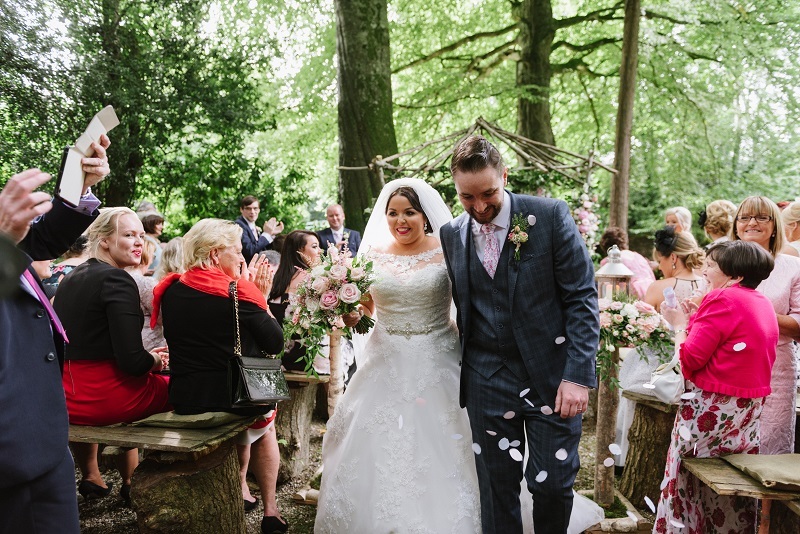 Of all the weddings I’ve had the pleasure of being involved with I have to say this Woodland Ceremony was just so beautiful. 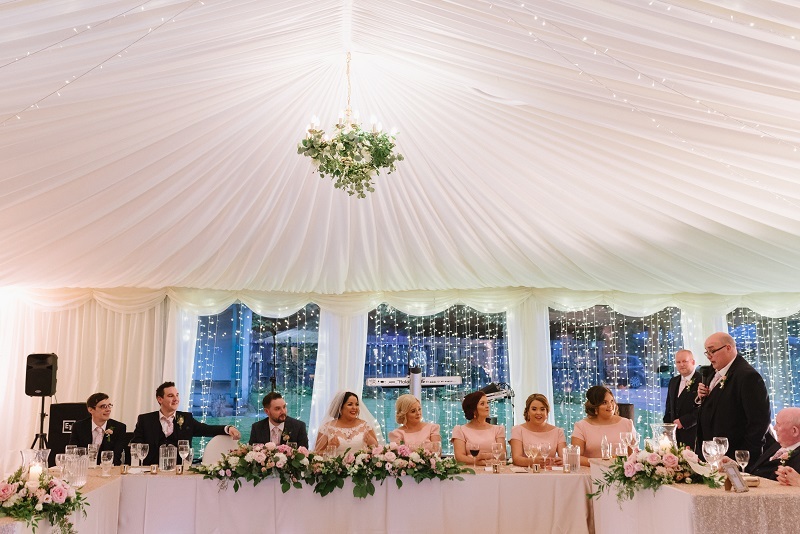 It suited Paddy and Charlene perfectly and the guests really enjoyed that it was a little quirky and different to the norm. House of Elliott transformed the area into an absolute fairy-tale with the most stunning floral arrangements I’ve ever seen. The clever thing was that following the ceremony we where able to move all the flowers to the Marquee to reuse as centre pieces. The sun shone all day, so we set up a drinks reception for the guests at the front of the hotel where they enjoyed a Prosecco Cart from Lily Annabella and gorgeous canapes while the Bridal Party went off for a photo session with photographer Sarah Fyffe. 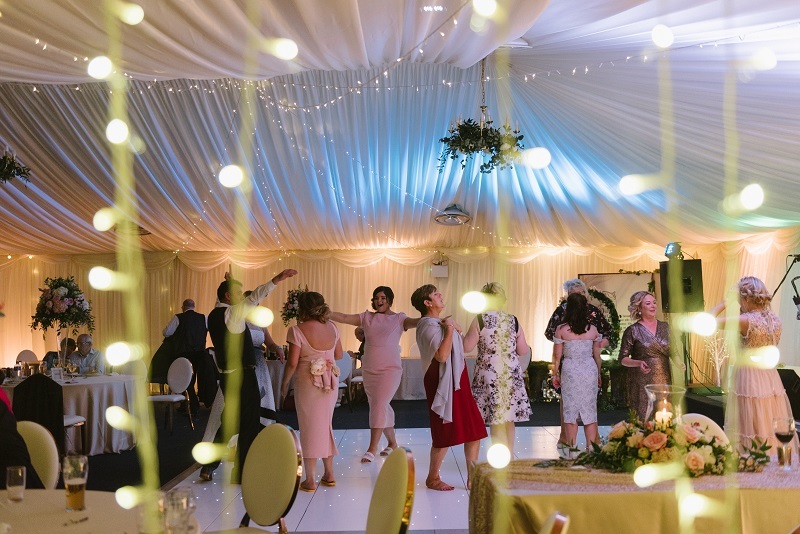 The grounds of the hotel are perfect, so it meant a nice relaxing afternoon for everyone with no rushing around and the guests could walk the short distance to the Marquee. There’s so much I could tell you about this wedding, but I really will be here all day. If you’ve managed to read this far them I’m grateful! I loved working with this couple and they made my job so easy by just trusting in me and letting me use my knowledge and experience to give them a wonderful stress-free day. We had lots of laughs along the way and poor Paddy thought he had two nagging wives on the day! I just want to say a heartfelt thank you to you both, your families and bridal party for making me feel like part of the gang on the day and letting me boss them around a little! As I mentioned earlier there’s so much more to write about this beautiful Wedding so keep an eye out for part 2 where I will give you more info and photos of the amazing suppliers involved.